The Elf Magic Elves enjoy ‘everything’ snow; from cruising the half pipe, skiing in the fresh powder and building a snow family. They will be surprised and happy to play in the snow with you when they arrive and find their trusty snowboard and skis waiting for them. 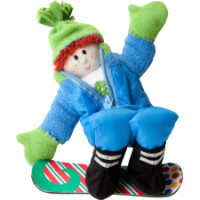 Of course, you’ll need an Elf of your own to play on these new snowboards and skis. To find an Elf, click here: Meet the Elf Magic Elves! Print Elf Magic Snowboards and Skis on heavy card stock paper. To make the Snowboards and Skis more “durable”, print them on heavy card stock or a whole sheet of white label paper. Adhere the card stock with glue or peel off the back of label paper and place on the product you have chosen to use as your base. 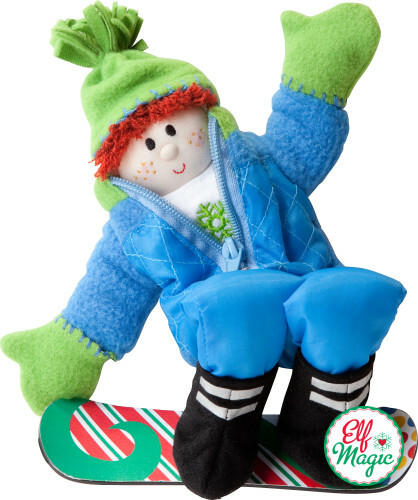 Use rubber bands or pipe cleaners to attach the snowboards and skis to the Elf’s “Arctic Play Snow Boot” or his/her green Elf shoe.